Personalize your paper napkins with your own special word, name or initial for any occasion. Choose from four sizes in 26 popular colors. Make your special event stand out with custom design napkins from Weddingstar. 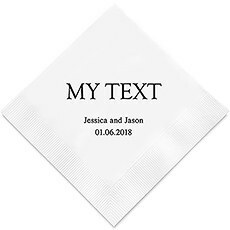 These personalized napkins allow you to add a thoughtful touch to any occasion, whether it's a wedding reception, a baby shower, a birthday party or another important event. With our affordable prices, customized napkins offer a budget-friendly way to make your celebration unique and memorable. These are decorative touches that every guest will notice since napkins are essential for any type of party. Plus, they let you incorporate your own unique sense of style when choosing the small yet important details for your event.Just about every element of these napkins can be customized to your needs, allowing you to easily stick with your design scheme and add a colorful accent to the party. When you design your own napkins at Weddingstar, start by selecting the size you need. We offer cocktail, luncheon and dinner napkins, so choose one size or multiple sizes for use in various aspects of your event. You'll have 26 beautiful napkin color choices, plus a variety of imprint foil options for the color of your text. Add your own custom text to complete the design, or choose from our monograms, logos and graphics to add a fun decorative touch. For example, you can choose a sweet quote for your wedding napkins or add a themed logo for a baby shower, bar mitzvah, holiday party or birthday party.Design your own wedding napkins or event napkins at Weddingstar to add high-quality, stylish accents to your celebration. In addition to pretty birthday luncheon napkins and romantic wedding cocktail napkins, we offer a variety of other customizable decor for special events of all kinds. Check out our personalized cake toppers, wedding decor and more to discover even more ways to incorporate your personality and style into any type of party or celebration.